The Qomolangma Nature Reserve is in Tingri County, Xigaze area in Tibet. The reserve embraces vast plateaus and majestic glaciers. 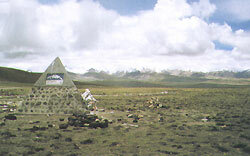 The southern foot of the Qomolangma Peak below 3,000 meters is a world apart. The remote forests block out sunlight and yet the forest is blossoming with flowers and the whispers of bird song. This magic place is attacking increasing numbers of visitors. Climbing from the southern foot of Qomolangma Peak are a low tropical season rain forest zone, a highland subtropical broad leaf forest zone, a warm temperate evergreen coniferous forest zone, a hard leaf evergreen broad leaf forest zone, and a semi-highland temperate and frigid evergreen coniferous forest zone. The Karmar valley is praised as one of the world's spectacular scenic spots. Karmar valley is at the foot of the east slope of Qomolangma Peak and at the juncture of the Pumqu and Karmar rivers, 2,300 meters above sea level. It is 55 kilometers from east to west and eight kilometers from south to north, covering an area of 4.4 million square meters. In its primeval forests are 20 species of azalea. Qomolangma fir, deciduous pine, birch, arrow bamboo, cloud fir, Nepalese sandalwood, lily magnolia, Radix notognseng and Rhlzoma picrorhizae not only offer a rare and beautiful sight, but are also valued for medicinal applications the middle section of the valley abounds with Qomolangma fir that can have a diameter of four to five meters. Ancient cypresses grow in plots in Sagufang.ln spring, azaleas blossom and the birds sing in the forests to create a mystical, magical mosaic of nature.